My Husband Makes the World's Best Cornbread! 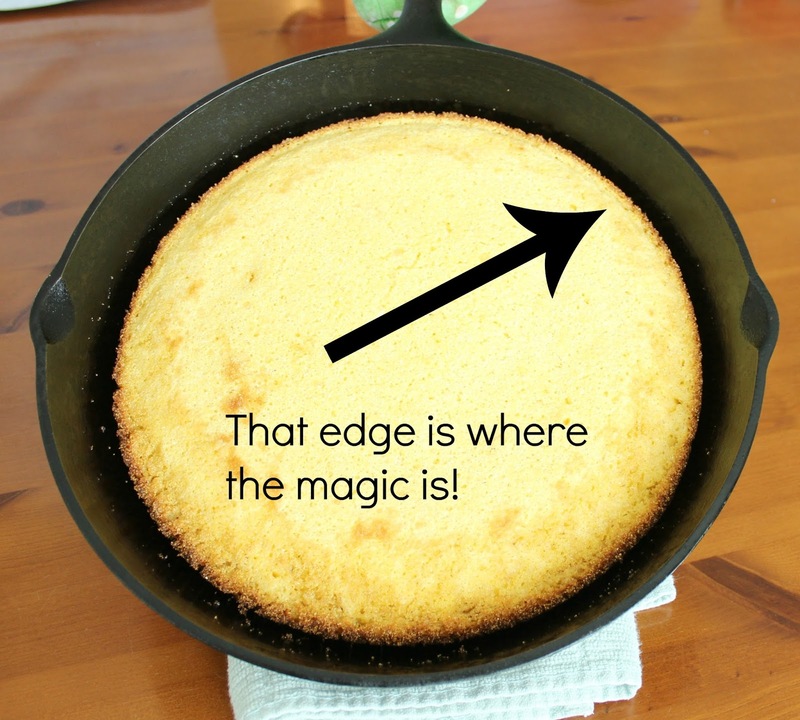 With cooler weather and comfort food season upon us, I thought it was time for my husband to share his World's Best Cornbread with you. Now to say it is the world's best is really bragging but I'm not kidding; this is the best! This is so good, I'd go so far as to say my hubby should get his own cooking show..or a gold star...or at least a kiss on the cheek. Some might consider cornbread to be poor man's food and I'm sure it started that way but here in the south we consider cornbread to be a delicacy or its own food group. 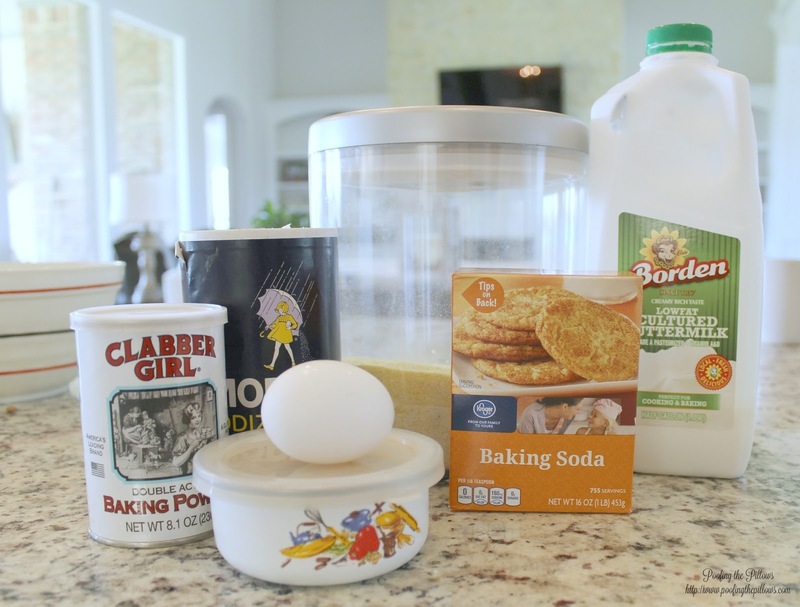 To make this recipe you start with basic ingredients: corn meal, buttermilk, baking soda, baking powder, salt, one egg, and bacon grease. The most important part of this is your well seasoned cast iron pan. If you don't have a well seasoned cast iron pan then don't even bother. Cake pans are not for cornbread. Period! Go to the store and buy a cast iron pan and please make sure it's made in the USA. Preheat your oven to 450 degrees. 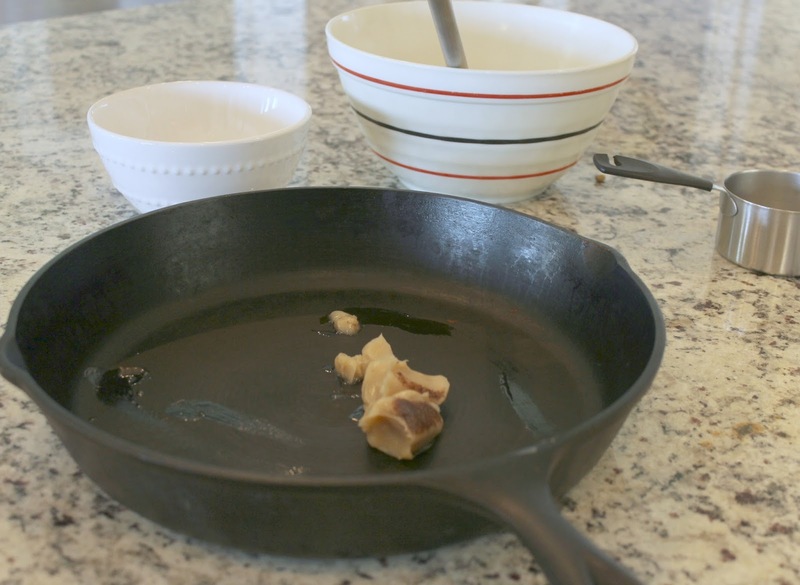 Place the bacon grease in the cast iron pan and let it heat in the oven until the grease is completely melted and very hot. No bacon grease in your kitchen? Then stop and fry some bacon. You'll thank me. While the pan heats in the oven, mix your wet and dry ingredients together. Do not overwork this process. It's quick and easy. When the grease comes out of the oven it's smoking hot and everybody needs to get the message to stand back! You want the grease hot like this because this is how you get the best texture from the cornbread. Pour the batter into the hot grease and watch is sizzle. You are actually giving the corners of the cornbread a little frying action. Bake at 450 for about 15 minutes or until the edges pull away from the pan and the center is done. Quickly grab the butter! Slice the cornbread and enjoy. 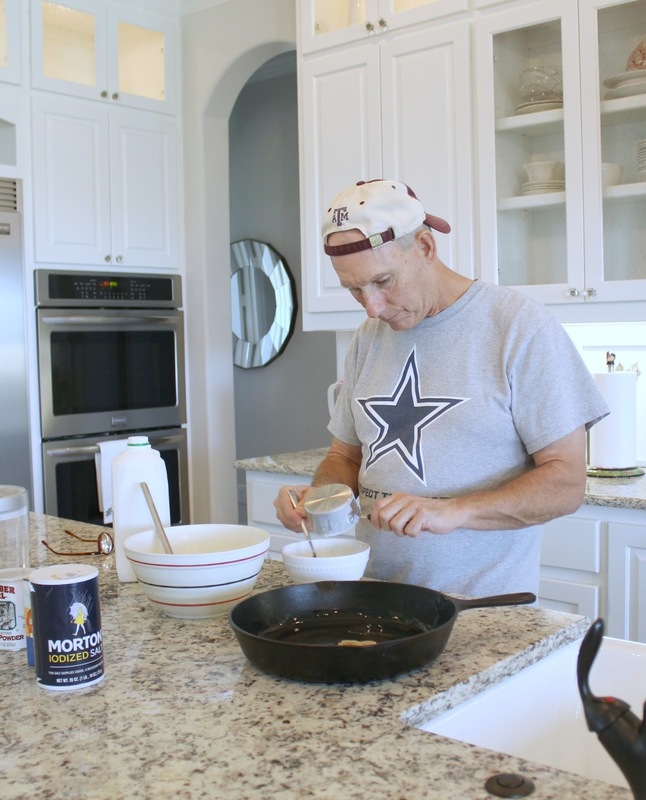 If you are really lucky you'll have a pot of pinto beans too. In a perfect world, someone handsome and sweet would let me have the crispy edge that goes all the way around the pan. That hasn't happened yet. This cornbread falls into the category of happy food...soul food...comfort food...or as my son sometimes says, "Deep fried happy." Preheat oven to 450 degrees. Put 2 tablespoons bacon grease in cast iron pan and place in oven to preheat for 10 minutes. While the skillet is heating, mix dry ingredients. Beat the egg and stir into buttermilk. Just before removing heated skillet from the oven, add buttermilk and egg mixture to dry ingredients and stir just until moist. Do not over mix. 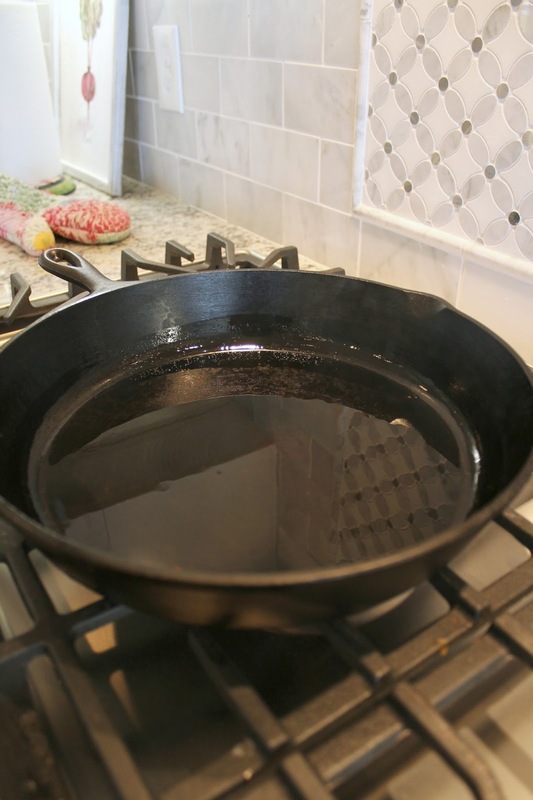 Remove hot skillet and tilt around to coat sides of skillet with melted grease. Pour cornmeal batter in heated skillet and place in the hot oven. Bake for approximately 14-16 minutes or until sides have pulled away from pan and top is slightly brown. Just look at your handsome Mr. cooking up the cornbread in the cast iron skillet!!! Man this looks good. Now I'm a wondering if my Mr. Nine would do a food post...well, most people know how to make PB&J so probably not, lol.... but now cornbread...thats a WINNER!!! I love cornbread, and that looks so good! How in the world did your handsome let you get that picture of him biting into it, let alone baking it?! What a good sport! Wonder how many will try to get their hubsters to do something similar, hehe. Thank, sounds good. I will be giving it a try. Funny story, Hubby loves to make his bisciuts with buttermilk. One day Granddaughter was over, she was about 14 at the time. She went into the frig to get some milk to drink. She came and whispered to me "Nana, your milk is bad"
I told her it was new and went to look. She got the buttermilk by mistake. We had a good laugh. Stacey...I am so making this recipe...my guy will love it! And I'd really love your recipe for the Pinto Beans to go along with it! Thanks to your hubby for sharing! I feel the need to get up and go straight to the kitchen. I love cornbread so much. I will have it for supper:) I am sure it is even better when the hubby makes it. I pinned this! His cornbread looks awesome. I'll have to try his recipe--I make pretty good cornbread myself, but I haven't made it with bacon grease. That's a brilliant idea! Good Morning Stacey. Gotta love a man that can cook. This looks so good. My hubby's favorite is cornbread so I may just have to try this. Sooooo good right now with Chili. Thanks for sharing. Have a great start to the new week. A good cornbread can almost be a meal in itself. I promise not to add sugar...love this recipe because is it mostly cornmeal. Most cornbread recipes are almost cake like, too much flour. We are having turkey chili tomorrow so this will be on the menu. Kiss that sweet man all over his face for sharing his recipe. ha! Stacey, you are making me hungry this morning. This is the way my grandmother made her cornbread. She also put bacon grease in her navy beans, and cooked her popcorn in it. Cast iron pans are the best! Thanks for sharing this recipe. Happy Monday!!! How incredible does this look...I can taste it from here! I so wish I could teach my husband to bake! Great job! Corn bread is my favorite and this looks so good! My husband loves his cast iron plan and I am going to give him this recipe, since he is the chef around here. :) Thanks for sharing your sweet husband's recipe! Buttermilk and bacon, helllooooo yum. 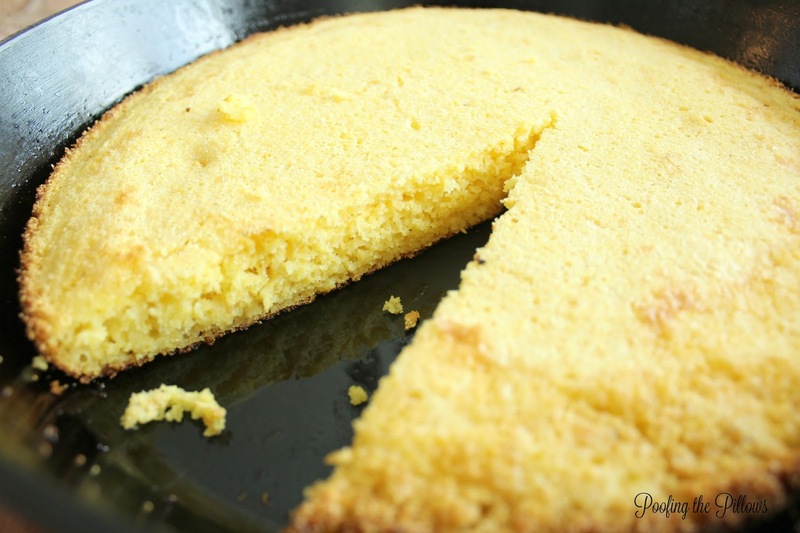 Sounds exactly like my recipe except I add a little flour - no sugar in real Southern cornbread. And it's the world's best, too! Stacey, this recipe sounds wonderful! Can't wait to try it. I love cornbread with chili and other bean recipes and with fall's arrival, i cant get my mind off chili and cornbread. I think I'll make both this week. Thanks for posting! He sounds like a keeper to me! I love cornbread. Been eating it my whole life. I do have a cast iron pan so this is a must try. Thanks for sharing a family recipe! I am excited to see this post. I have been wanting to make corn bread from scratch for a long time and this sounds wonderful! I am pinning it! Looks great! I've been wanting a cast iron pan. Great reason to get one! I often think that the most delicious food is food that someone else cooks. This is like the cornbread my grandmother used to make. No wonder it's the best in the world with that bacon fat in the bottom and the cast iron pan. It looks fabulous -- Rick has a cast iron -- I think I need to borrow it! 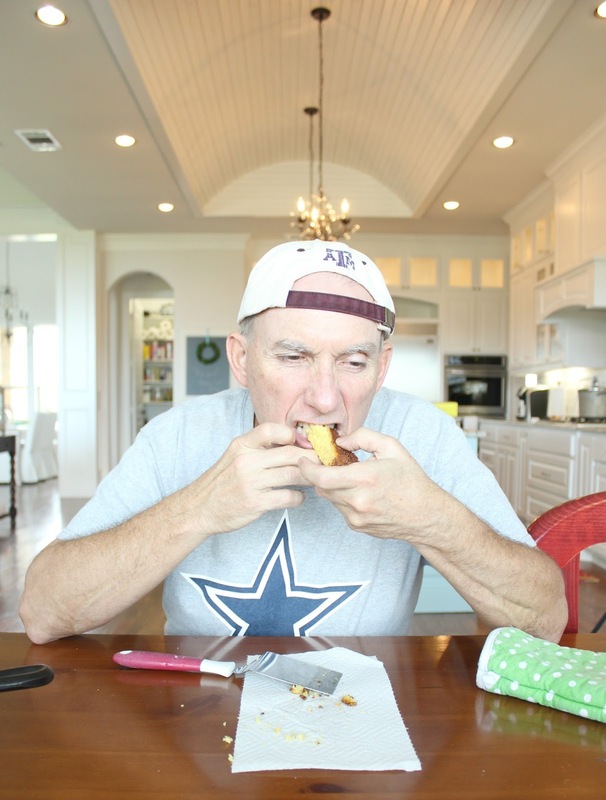 That last picture of your husband biting into the cornbread is priceless. I actually just ordered a new cast iron skillet. Ours was flooded. I probably could have cleaned it up and restored it, but the thought of that nasty water on something I cook with was just too much. What kind of camera do you use? Your photos are great! This looks fantastic!!! I love the bacon grease idea! And yes to only using cast iron. That's like a rule in the south. ;) I still make your biscuit recipe often and now I need to try this too. Yum! Hi Stacey! Honey, you are so blessed to have a cornbread cooking hubby! This looks so good and I'll certainly try his recipe. That is one awesome looking pan of cornbread! We always make ours in a cast iron pan too. Wouldn't have it any other way. You make this sound so good! Ready for a piece right now! Pinned. Looks delicious! I will have to save the bacon fat next time I make it. We love cornbread! Have you seen the latest issue of Southern Living? There's an article and several recipes using artisan cornmeal, and I'm making the cornmeal and brown ale soup tonight. I hope it turns out delicious! Your blog looks wonderful, so pretty and updated and boy does your handsome baker cook up some mighty fine bread! Oh, my word! Bacon grease?!?!??! Really??? Wow! I want to try it, but I’ll need plenty of others to share the pan. I’m sure it’s delicious, and I’d want to eat the whole thing! Oh yeah! That sounds and looks delicious. Going to print that out and start making my cornbread this way! I was fortunate my mother found me a wonderful cast iron skillet in my early days of marriage (she always cooked in one!) and seasoned it for me too! It's what I use every single supper. 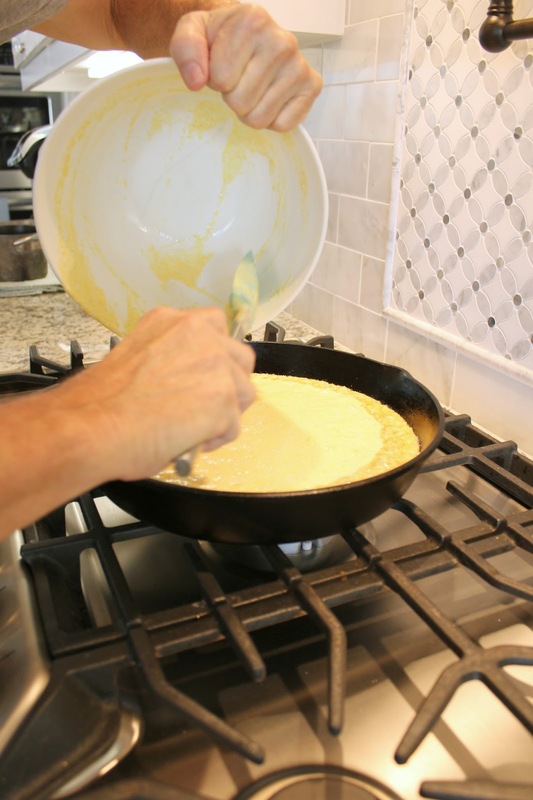 We love cornbread around here and this recipe sounds delicious! We will be trying it for sure! Stacey, I learned how to make cornbread from the best, my sweet Momma. Forget making corn bread if you don't use bacon grease! That is a beautiful skillet of corn bread! I love cornbread and how lucky your are that your husband makes it. Thanks for the recipe. I pinned the recipe to make when Steve makes his first batch of chili. How great to have your hubby share his recipe!...It looks and sounds amazing and yes, the edge is definitely where the magic is!!! Oh my gosh I love cornbread and this looks heavenly!! What a good hubby you have....even if he DOESN'T let you have the crispy outside all to yourself!! Your hubby is such a cutie, Stacey! His cornbread looks absolutely amazing, and a must-try! Thank you for sharing. That really does look good. I love cornbread. We don't have it very often. I love it with homemade vegetable soup. We have a large seasoned iron skillet so we should give this a try! A man who makes Cornbread! Girl, you lucked out. I love Cornbread and have amassed quite a collection of recipes over the years. Great post! This is the third thing I've run across today that tells me we need a cast iron skillet pan. Golly, we're such Yankees. LOL. 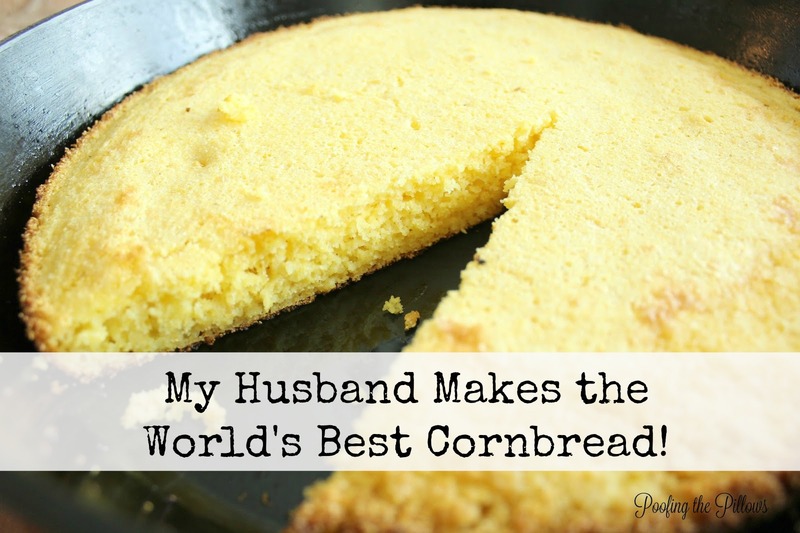 MY hubs LOVES cornbread - he is going to LOVE this post, and I am sending it to him so he can be to me what your handsome cornbread maker is to YOU. Yum. Boy does that ever sound good right now. YUMMMMMMMMMMMMM. Your new look is so pretty and refreshing! I love cornbread, and my daughter loves it even more. We used to buy some once a week from Whole Foods, which was conveniently just across the street from where we lived in Toronto. Your hubby's, though, I'm certain is the best! Oh, that looks so delicious. My daughter makes the cornbread at our house.